Religion is a fundamental part of human experience and is deeply concerned with questions of “making sense” and “meaning” of our world and our existence. It constitutes the symbols, historical narratives and cosmologies that make the meaning of life or the cosmos intelligible. Religion is not only personal, but also social. It plays a crucial role in contemporary society and politics. The domain of the sacred interacts in diverse ways with institutions of power, gender norms, historical change, the economy and other aspects of society. Despite the significance and pervasiveness of religion in society, and because it spans across so many different realms of human experience, it can be a challenge to define what we mean when we speak of “religion.” For example, though the notion of “belief” is a fundamental part of Protestant Christianity, it is of less relevance to tribal religions, and is considered by Buddhists to be a impediment to the realization of Buddhist descriptions of reality. Definitions notwithstanding, religious worlds are vivid, meaningful and true to those who construct and inhabit them. By studying religion, we discover the value and power of those worlds. So how does one study religion? A straightforward answer is to read and study the sacred texts of a particular faith. There are thousands of seminaries around the world devoted to the study of the Koran, Bible and Torah. Others study at a Buddhist monastery or Hindu Temple. Another option is to study religion from an academic perspective. Topics are as diverse as the history of Catholic Church in 19th century Paraguayan politics, artistic representations of the Hindu deity Varuna or the architecture of mosques in Cairo. While all of these examples are wonderful ways to study religion, this handbook will teach you how to study religious groups from the perspective of a social scientist. Studying religion from such a perspective is a critical exercise of interrogating the familiar and encountering the other. By studying religion, we may discover new forms of religious experience evolving in the contexts of a globalizing world. We may gain insights into how people negotiate and adapt to these changes. By investigating religion, we also find that contrary to the prophecy that religion is on its way out, religion is, in fact, on the rise and emergent everywhere. We may discover the sacred in the most unexpected places and times. 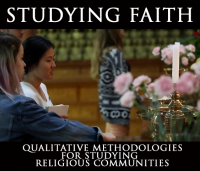 We hope that this resource serves as a handbook or “how to” guide for students interested in studying religious groups from the perspective of a social scientist using qualitative research methodologies. It will help you decide what group or groups to study, how to study them, which people to talk to once you arrive and how to analyze the data you collect. You will not be able to learn everything there is to know about conducting research on religious groups, but this resource should give you enough to get out and start collecting data. You will learn many more lessons in the field. 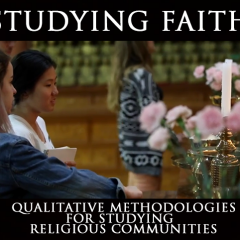 The material in these pages is organized as a set of 17 frequently asked questions (FAQs) about how to apply social scientific methodologies to studying faith and religion. You can access short reading materials and watch videos related to the question by clicking on any of the FAQs in the menu (see right-hand sidebar on a desktop computer or below on a phone). You can also read through the report by clicking on “next in the report” at the bottom of the page. You have the choice to read the material in sequence like a series of book chapters, or you can jump to the questions that you find most relevant. Be sure to also click on any of the questions to the right to explore a topic more fully.